I've been going through a bit of a writing rut lately, so instead of just trying to write about nonesense, I've taken the time to try and just take things in and read and listen instead. Here's just a few things I've read online as of late that really got me thinking and inspired to write. ♥Modesty doesn't mean what you think it means according to the Bible. ♥Slam Poetry: What Guys Look For In Girls. ♥A Moment of Honesty On Street Harassment. Hello there! I love your blog and your sense of style, it's just wonderful. I think we even go/went to the same college (I just graduated). I'm a new follower and I would be ever so grateful if you'd follow me as well! i totally love your pants and i made a note about your readings'suggestions! I just have to tell you that I have been following your blog and instagram for a while now, and you seem to be such a sweet and nice girl. 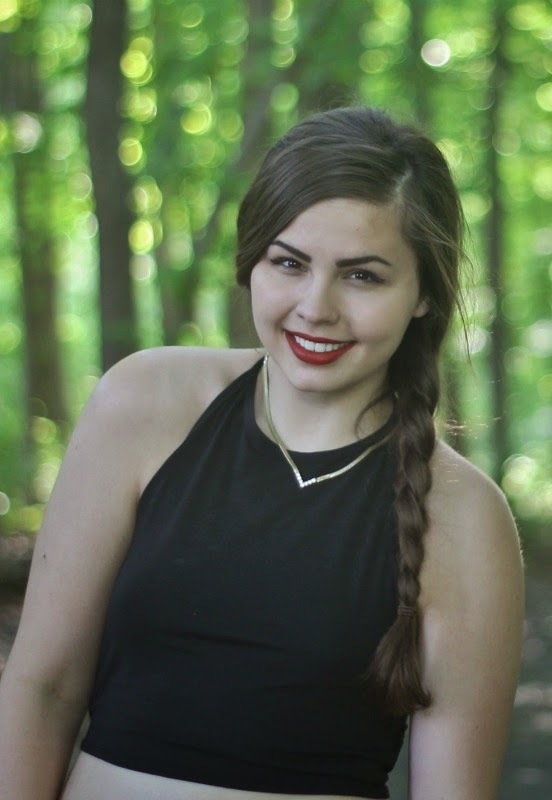 Your style is so inspiring and also you are beautiful! 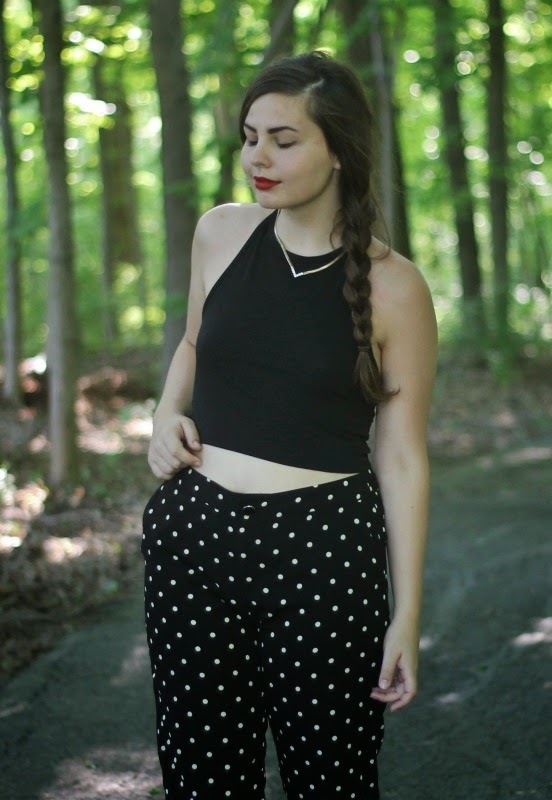 I've been looking for some cute polka dot pants recently, and yours are so perfect! High waist pants are my fave. Good reads too, I especially liked the one about catcalling. Men who catcall are the worst! The article about modesty is really interesting. Modesty is something I've been thinking A LOT about recently, probably more than I should if I'm honest. I've got to admit I loved the conclusion that it doesn't matter what you wear so much as what is in your heart. At least that was what I took from it. On a side note I love that outfit! I think it's great how one day you dress really girly and the next a little edgy then the next classic and elegant, I really like how you try lots of different styles and have fun. love this post! Cute pants too. Your outfit is so adorable! 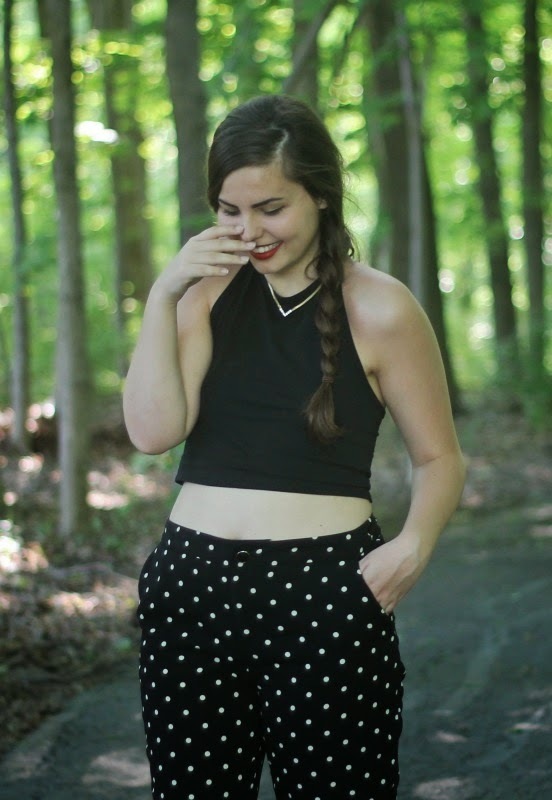 The polka dot pants and crop top combo is such a ladylike take on the crop top trend. I loved these links! Thank you for being such a positive role model! So, I'm super behind on reading blogs, but I just had to say one, that you look adorable. And two, Rachel Held Evans is THEE best. I have two of her books and they are amazing! Highly recommend, lady!